Empowering our customers is at the heart of the SuiteCRM brand and our provision of free open source CRM software is definitive proof of this (yes, we did say ‘free’). Don’t be fooled into thinking that just because it is free, it isn’t powerful. It is feature rich, powerful, flexible and extremely user-friendly. So much so that it is considered to be one of the most popular applications the world over. Don’t worry though, in creating our hosting service SuiteCRM On-Demand, we have made sure that no-one has to miss out. Whilst we can’t offer this version for free (we are a business after all), we can and have built in a great deal of flexibility including a no-lock in approach ensuring that both the data and the application belong to you ALWAYS. We believe in what we have to offer and put our faith in our ability to deliver– no fixed contractual obligations for us! Our No Lock-in Guarantee is one of the things that makes us so different.. Feeling empowered yet? Shall we tell you more? SuiteCRM On-Demand is designed to meet the needs of the smallest start-up to the biggest multi-national. You need only purchase five licences to get started and it is completely accessible without the need to download any software. Looking for your sales team to have access whilst out on the road? No problem, SuiteCRM On-Demand includes an option for the application to be available via phone and tablet (as well as PC of course). This flexibility coupled with state-of-the-art security and seamless upgrading really will give you the ability to unlock the true potential of your data, and in doing so, watch your sales soar. Customer self-service is no longer a dream. It's a snap. Manage all your customer issues through an easy to setup and use website. With secure login controlled from SuiteCRM, your service teams will be instantly notified of customers issues and your customers will know as soon as their issues have been dealt with. Customer self-service Portals (SSP) are essential in today's business world. The cost of delivering support through an SSP is far more cost-effective than email, call centre agents or web chat. Free your customer service team to do the hard yards of solving customer problems, not the hard slog of interpreting and recording the problem. 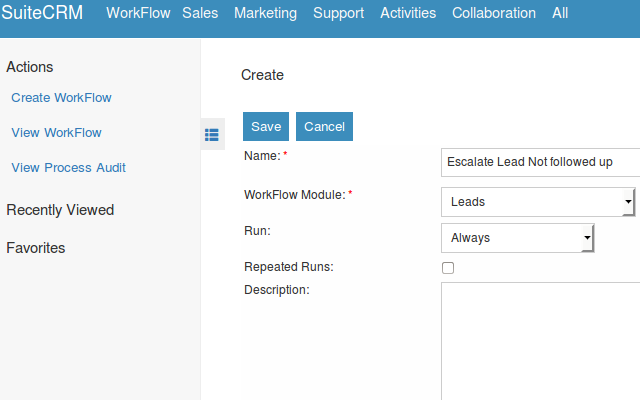 SuiteCRM's workflow module is an efficient, powerful, and flexible tool that delivers advanced capability to streamline and automate repetitive tasks freeing users to focus on selling and servicing customers. SuiteCRM users can model business processes and design flexible automated actions that are triggered to run at anytime. Model your sales pipeline quickly and easily. Free your sales people to do the high value selling you pay them to do, not the low value administration they hate. Produce beautifully templated Quotations, control your pricing strategies, make sure your Contract renewals are always serviced and make sure that every lead is followed up quickly and professionally. Easy to use with powerful impact. SuiteCRM has powerful reporting options. The easy to use Reporter included as standard produces granular, cross-module reporting that can be tabled and graphed. Output can also be displayed as dynamic Dashlets in a users' Home page. Producing a report is a breeze. SuiteCRM is now available with a responsive theme. SuiteCRM will automatically adapt to the device form and render beautifully on desktops, mobile phones and tablets. SuiteCRM's smart interface means you can use SuiteCRM when you need to, how you need to. SuiteCRM's responsive theme will render in most modern browsers. This means that it will work on Linux, Windows and Mac desktops. It will work on Android, Windows and Mac tablets. And it will work on Android, Mac and Windows phones.